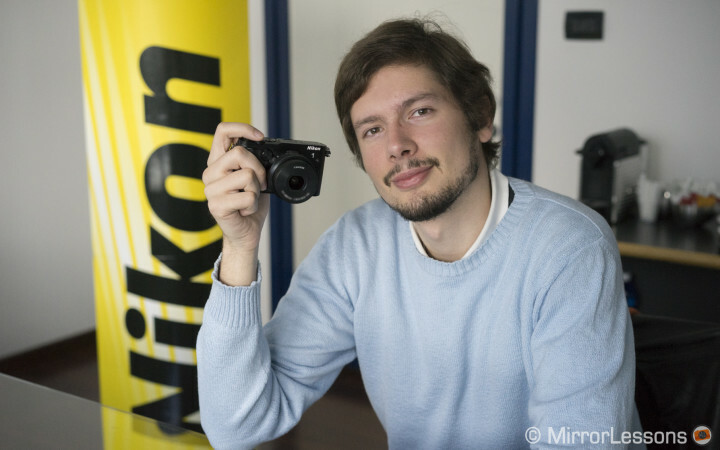 Today Mathieu and I had some exclusive one-on-one time with the brand new Nikon 1 V3, the only sample available in Italy at the moment. Since it was a pre-production model, we weren’t permitted to take any of the images or videos home but they had no problem with us taking some product shots of the camera and the 1 Nikkor VR 10-30mm f/3.5-5.6 PD-zoom. With any luck, we should be able to test a finalised version come April. Note: the 10-30mm lens was a pre-production model with incorrect inscriptions on the front and top. We were asked to hide them, which why you will find blurred out markings in some of the product shots. 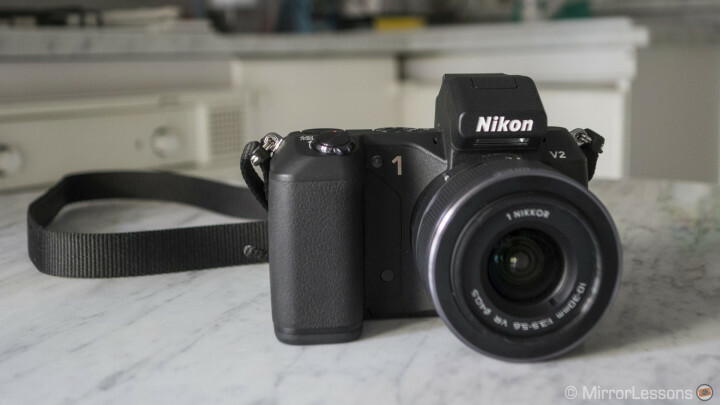 The first thing that struck us with the newly designed Nikon V3 was the absence of a prominent grip and a built-in viewfinder. They now come as optional accessories. After holding and shooting with the Nikon 1 V3 for 20 minutes, we have come to the initial conclusion that it is the most well-conceived 1 system camera to date. It has an extremely solid chassis with a well-designed rubber thumb grip which both Mathieu and I found comfortable. 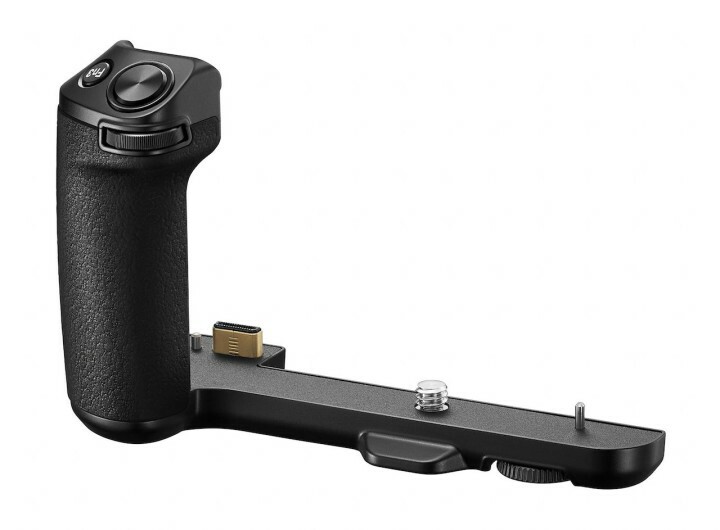 The rubber grip also extends to the front of the camera, and is pleasant to hold. It is true that the V2, with its protruding grip, is more ergonomic but the V3 manages to retain an attractive design while remaining functional. 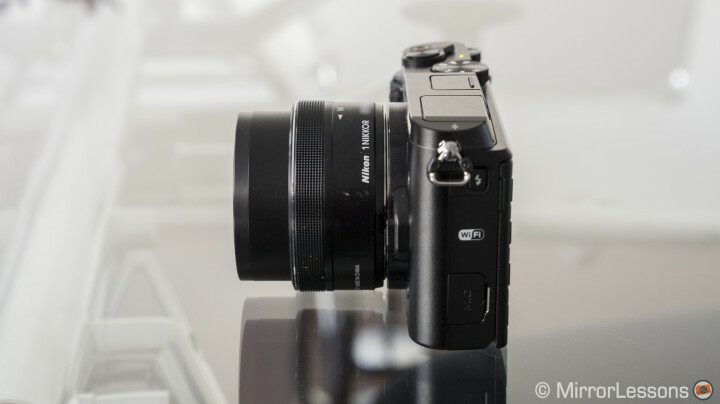 For those who wish to enhance their grasp on the V3, there is the optional GR-N1010 grip that you can buy with the camera or separately. The most welcome addition is the front dial which sits flat against the body of the camera below the shutter button and beside the grip. Its primary function is to change the aperture or shutter speed. Despite the difference in length of our pointer fingers, both Mathieu and I found it easy to reach and rotate. It is neither excessively smooth nor flimsy – each twist of the dial feels substantially stiff and satisfying. We found its placement both original and practical, as it avoids overcrowding on the top of the camera. Sadly, the Nikon staff didn’t have the new GR-N1010 grip on hand to try out, so we can’t say whether its presence impedes access to this dial or not. There are two customisable function buttons on the back, one of which gives you access to a quick menu with the most important functions. You’ll also find a PSAM dial with extra options such as creative shooting and live motion snapshot right on the dial. 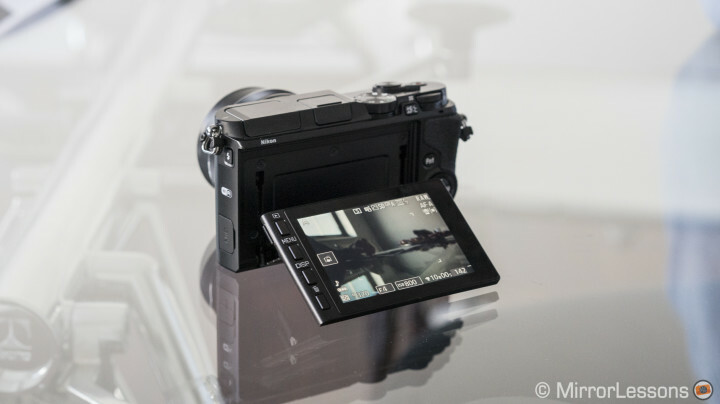 Though tilting touchscreens have been around for a while, the Nikon 1 V3 is the first in the 1 line-up to have one. From what we saw, it works very well. 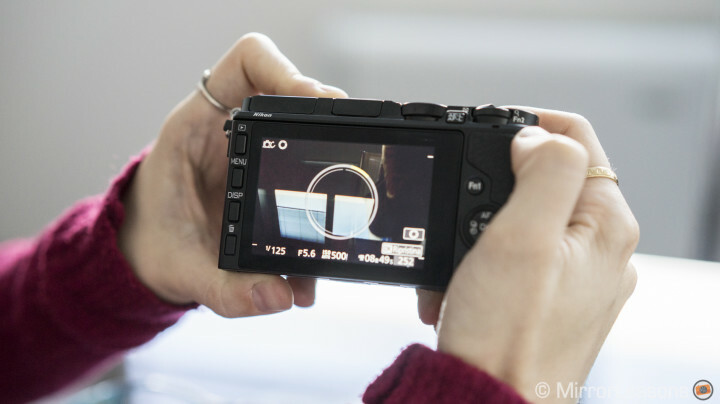 We observed that you can activate or disactivate the autofocus from the touchscreen but we didn’t check to see if you can pick an autofocus point like on the most recent Olympus and Panasonic models. Pulling out the screen from the body, the joints appear both sturdy and flexible. 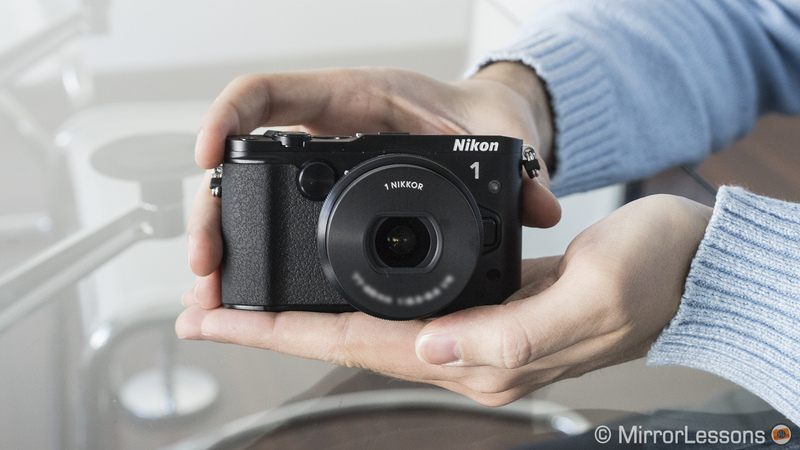 As with the other 1 system cameras, the Nikon 1 V3 is perfectly compact at 4.4 x 2.6 x 1.3 in (111 x 65 x 33 mm) – more or less the same size a Sony RX1 and a bit smaller than a Fujifilm X-M1. At only the slight risk of hyperbole, I’d say that the autofocus on the Nikon 1 V3 is so fast that it almost feels as if the camera takes the shot even before your finger hits the shutter button. We had already experienced the speed of the Nikon 1 system during our weekend with the V2, and after trying the V3, we believe that it is probably the fastest MILC on the market as of March 2014 in both S-AF and C-AF modes. Its incredible speed can be attributed to the presence of the 171-point AF system with 105 on-sensor phase-detect auto-focus points – the first on a Nikon 1 camera. 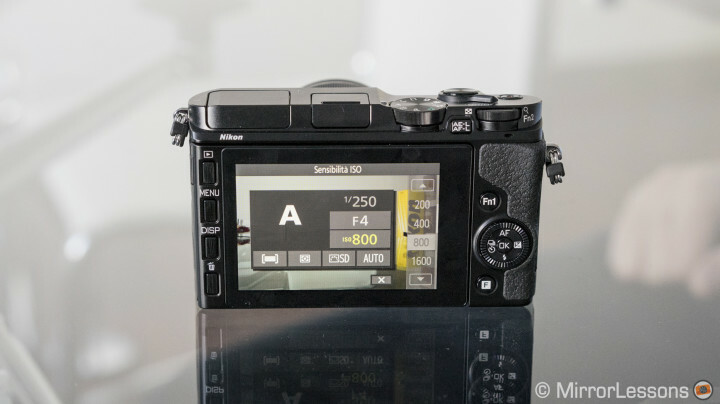 Even the most advanced DSLRs on the market do not live up to the AF specifications of the V3. Though we only used it briefly, I was very impressed with its speed and accuracy. The face-detect mode also seems to be extremely precise. The new EXPEED 4A processor makes it possible to take 20 fps in continuous autofocus mode, and a maximum of 40 raw format images at up to 60 fps with focus fixed at the first frame. When you play back the images quickly in sequence, it is as if you are watching somebody flick through a flip book cartoon animation. It’s that quick. 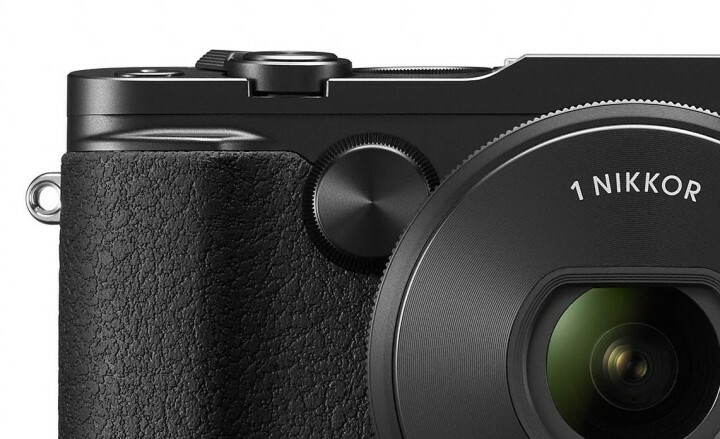 The Nikon 1 V3 has an 18.4 MP CMOS sensor with an ISO range of 160-12800 and no low-pass filter. As we mentioned at the beginning, we were not allowed to take any images home with us but from what we could see on the screen, there appears to be an overall improvement with regards to high ISO performance compared to the V2. Let’s hope this is the case! The video features have also been enhanced and one of the most important additions is the ability to shoot 120fps in HD (1280×720), which can be useful even for advanced video shooters. You can also select higher frame rates (400fps and 1200fps). 1200fps will drastically reduce the size and image quality, but we’re curious to test 400fps. It won’t be HD but even standard definition can be interesting for certain things. The camera also features electronic VR (vibration reduction) for smoother hand-held shots and can shoot normally in Full HD at 50p or 60p. If you limit the frame rate to 30p, the camera can also automatically take stills at full 18mp resolution during video recording – a new intelligent feature that has been added to the plethora that already exists on the camera. There is also a fast motion feature and a new jump cut feature where the camera records one second every two seconds. Video wise, the V3 surely gives us a lot of options for creativity. 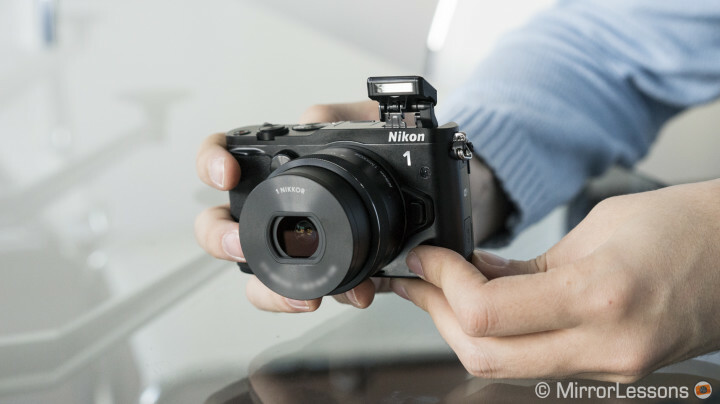 The Nikon 1 V3 is the first 1 system camera with built-in WiFi connectivity. It has a built-in flash and a hot shoe where you can connect the new electronic viewfinder DF-N1000 (not included in the kit). Unfortunately we couldn’t test the quality of the new external EVF as it wasn’t available yet. The specs are quite interesting however: approximately 100% of frame coverage and 2,359k dots. I’m sure it will be a must-have accessory for the camera. As a final note, the V3 does not accept normal SD cards but takes micro SD cards instead. There is also a new interesting feature called creative palette. It works in the same way as the colour creator control on the Olympus OM-D E-M1. By turning the dial or touching the circle displayed on the LCD screen, you can change the look of the image. Not being able to test the image quality, there isn’t much to say at the moment about the new kit zoom from Nikon. It has a zoom motor that is activated by slightly rotating the zoom ring. The zoom appears smooth and easy to control, and is very compact when retracted. It includes VR (vibration reduction) for sharper images at slow shutter speeds. 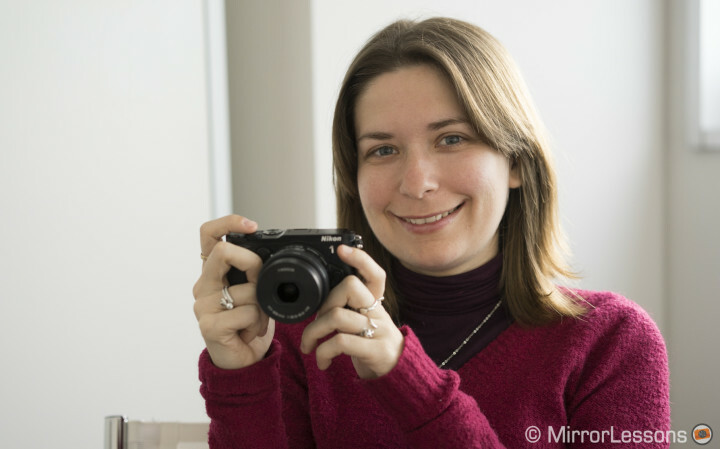 You can also turn the camera on and off simply by extending and retracting the lens. Recently, Nikon has brought out some very interesting niche products. The Nikon 1 AW1, for instance, is completely waterproof, shockproof, and freezeproof, making it the perfect compact companion for extreme sports like scuba-diving or mountain climbing. The V3 and the new 1 Nikkor VR 70-300mm f/4.5-5.6 telezoom could make an incredibly compact combo for wildlife photography given the equivalent 35mm focal length and fast AF of the camera. 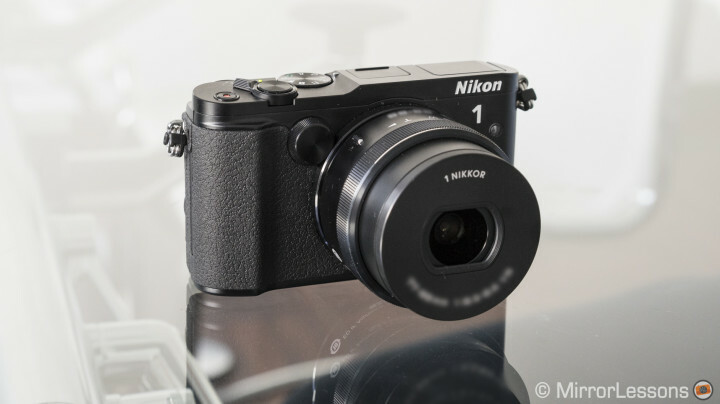 With products such as these, we feel that Nikon has the power to dominate some very specific niches where other compact system cameras might not prove as effective. Watch any Nikon promotional video about the V3 and you’ll clearly see that the company has put this camera forward as the advanced amateur’s or professional’s ideal companion for a DSLR, which is a far call from the “DSLR replacement” mantra the likes of Olympus and Fujifilm have embraced. The reasoning behind this is obvious: Nikon is a market leader in the DSLR sector and the last thing the company would want to do is create a replacement for an already successful product of theirs. However, with its many professional features such as high speed AF and continuous shooting, abundance of megapixels and excellent video quality, we certainly feel that the V3 could easily take the place of an entry level DSLR as far as quality is concerned. And imagine the ability to shoot up to 810mm (35mm equivalent) with a camera that has more than enough quality for an amateur and can fit inside any small bag! Of course, just as with the V2, the proverbial wrench in the works is the price. According to the German Nikon website, the camera plus kit lens will cost just under €1000. Add on the grip and electronic viewfinder and you’re already at €1249. The Nikon USA website gives you a slightly better deal as you can pre-order the camera, kit lens, grip and external viewfinder for $1199.95. That said, with so many other amazing compact systems out there, one has to wonder if the price is justifiable. 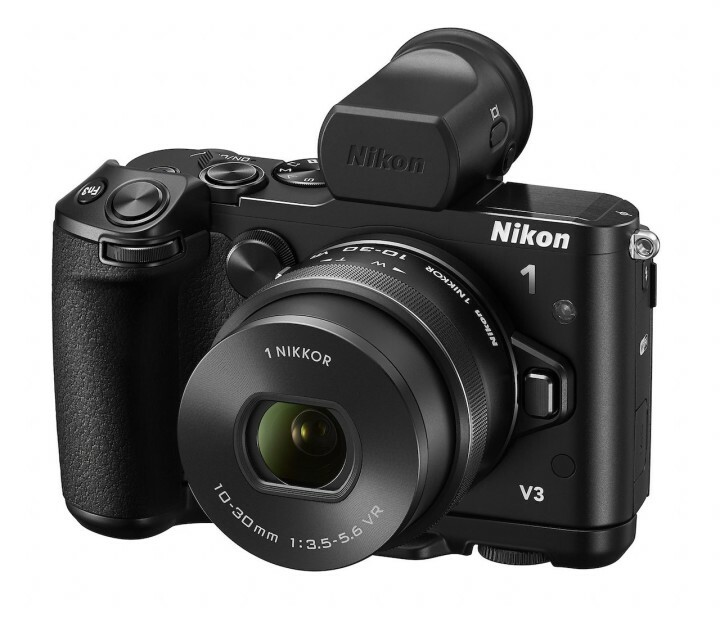 The Nikon 1 V3 will be available as of mid-April and according to Nikon, will be followed soon after by the successors to the J3 and S2 as well.